Power electronics became an identifiably separate area of electrical engineering with the invention of the thyristor about 30 years ago. The growing demand for controllability and conversion of electric energy has made this area increasingly important, which in turn has resulted in new device, circuit and control developments. In particular, new components, such as the GTO and power MOSFET, continue to extend power electronic technology to new applications. The technology embodied by the name "power electronics" is complex. It consists of both power level and signal level electronics, as well as thermal, mechanical, control, and protection systems. The power circuit, that part of the system actually processing energy, can be thought of as an amplifier around which is placed a closed loop control system. 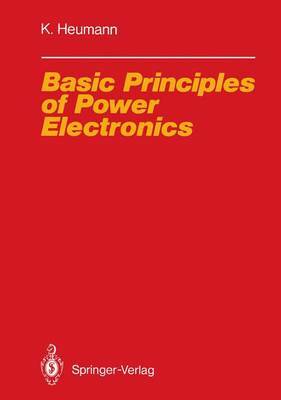 The goal of this book is to provide an easily understood exposition of the principles of power electronics. Common features of systems and their behavior are identified in order to facilitate understanding. Thyristor converters are distinguished and treated according to their mode of commutation. Circuits for various converters and their controls are presented, along with a description of ancillary circuits such as those required for snubbing and gate drives. Thermal and electrical properties of semiconductor power devices are discussed. The line-converter and converter-load interfaces are examined, leading to some general statements being made about energy transfer. Application areas are identified and categorized with respect to power and frequency ranges. The many tables presented in the book provide an easily used reference source.